Cummins-Wagner has a proven history of providing custom booster packages for commercial and industrial customers. Our EPS division is happy to introduce our BoosterDX product line of booster pump packages to join our established line of packaged systems. 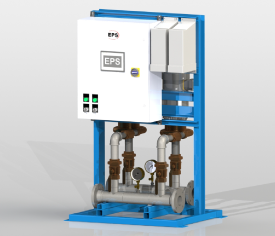 Our standard duplex model units provide a total range in flow capacities of up to 450GPM with boosting pressures reaching an excess of 200psi. 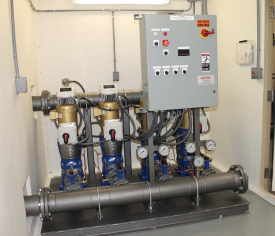 Standard triplex and quadplex booster models feature flow rates up to 1,350gpm. 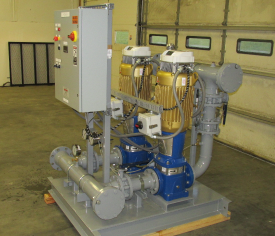 Additionally, our custom booster units are designed to fit any size and capacity. Variable speed drives and an intelligent control panel provide maximum control flexibility in a compact design. 6” HMI touch screen for clear system status display and intuitive set point adjustments. All units are fully assembled, wired, painted, and factory tested to guarantee full operability upon shipment and ensure a simple, worry free start-up. In addition to our standard units, our in-house engineering staff can create a custom package to meet your specific needs.